Buried in a cookbook from the 1960s, I first read about the Argentinian carbonada earlier this summer. Made to celebrate Argentinian Independence Day on July 9, during their winter season, stew weather seemed a long way off then. 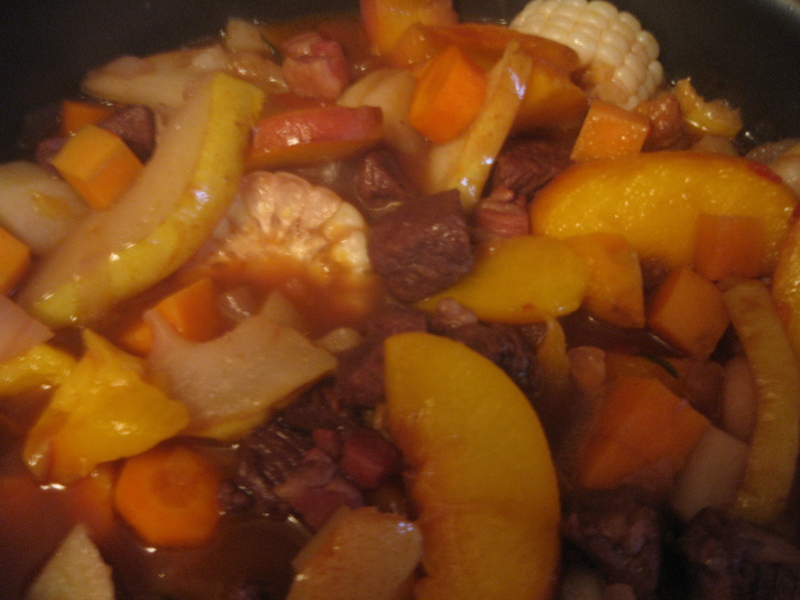 A mixture of beef, corn, peaches and pears, it seemed perfect for early fall, when the heartier fruits and vegetables come in just as the sweeter fruits of summer are fading out. Wishing I’d taken pictures of the market’s golds, purples, and reds, I felt like bit of a witch at her cauldron when they reappeared in the pot. Traditionally, the carbonada is served in a large pumpkin-like gourd called a zapallo. 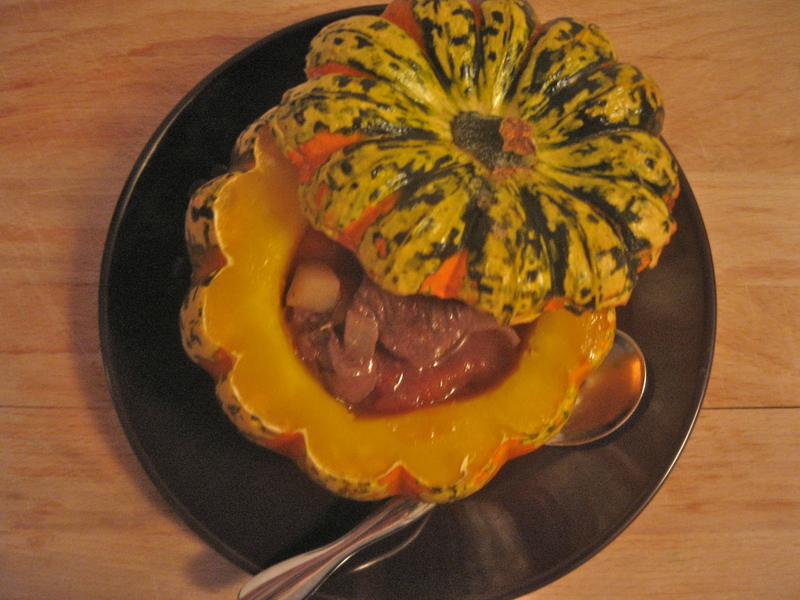 Hollowed out, baked, then filled with the stew, each serving includes a spoonful of pumpkin. With no fairy godmother to turn my northeastern squash into an Andean zapallo, I turned the small acorn and colorful delicata squashes into soup bowls instead. I adapted this recipe for Carbonada in a Pumpkin from Seven Fires: Grilling the Argentinian Way by Francis Mallmann and Peter Kaminsky. Though I followed the recipe closely, I used the more general name for the dish since no actual pumpkins were hurt during the making of it. The original recipe calls for a large Andean-type pumpkin or ambercup squash, about 4 pounds. I tried both the acorn squash and the hybrid delicata squash recommended to me at the Farmer’s market. 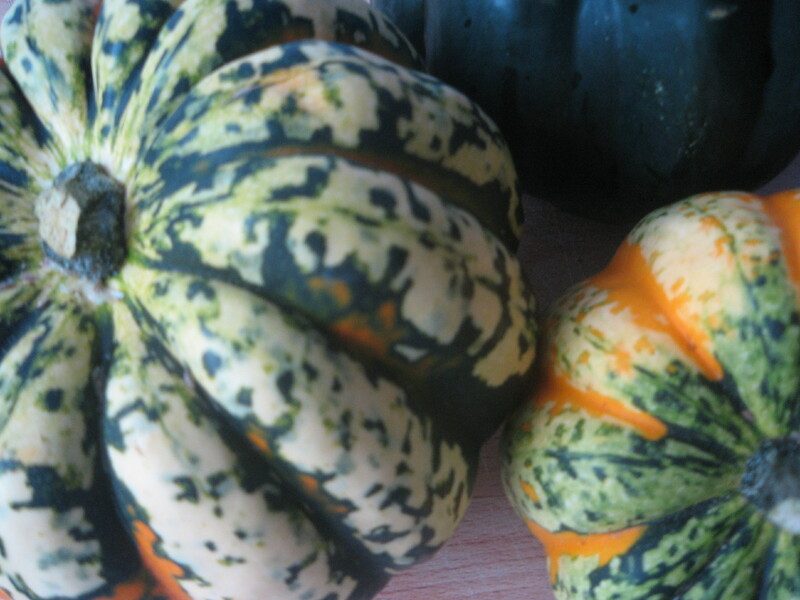 The acorn squash was sweet while the delicata was nutty, but they both worked well with the recipe. 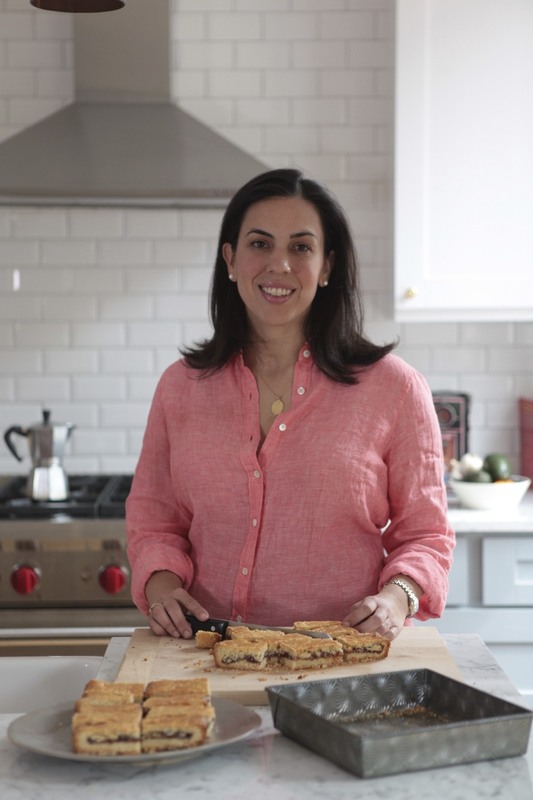 Though it seems like a lot of ingredients, all the work goes into the chopping and measuring beforehand (something I should always do but skip too often). The actual stew comes together easily. *I used beef broth for this batch. Freshly ground black pepper and salt to taste. Combine tomatoes and beef stock in saucepan, crushing tomatoes with wooden spoon. Cook over medium heat and simmer for about 5 minutes. Remove from heat and set aside. In a large pot or dutch oven, heat olive oil over medium-high heat. 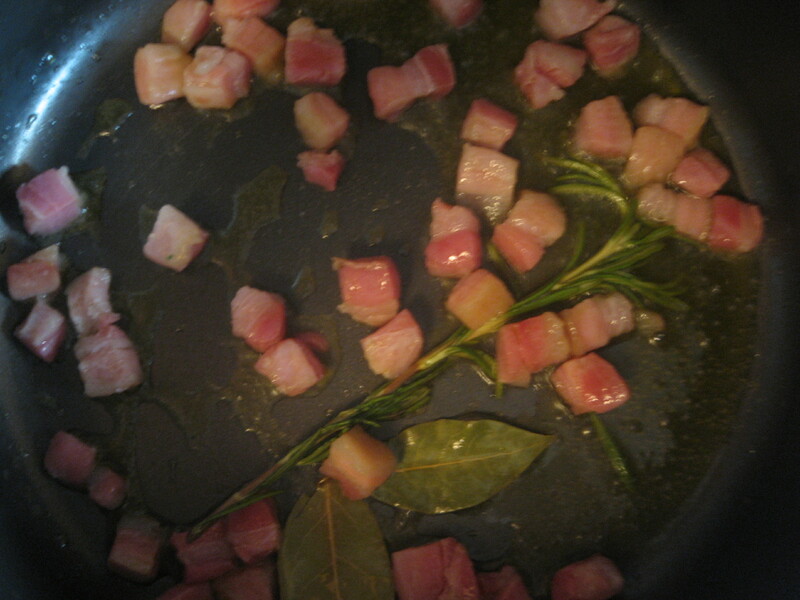 Add pancetta, 2 bay leaves, and sprig of rosemary and cook till pancetta renders fat. Raise heat to high and add beef and garlic cloves. Saute until browned on all sides. Add salt and pepper to taste and red wine vinegar. Boil until liquid evaporates. Add onions and sugar. Remove the rosemary sprig and add carrots. Pour in red wine and bring to a boil for 2 minutes so that the alcohol cooks off. Add potato, sweet potato, tomato mixture and bring to a boil. Lower heat to a simmer. 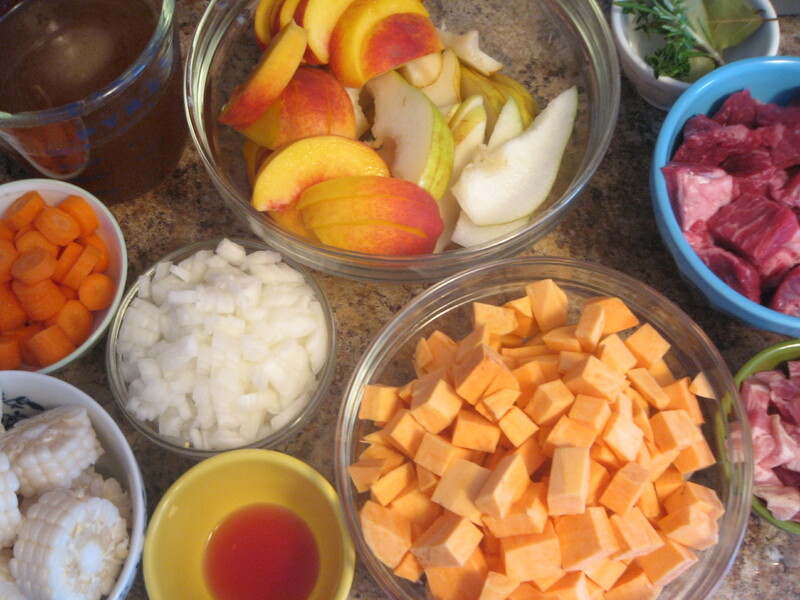 Add corn, peaches, and pears. Partially cover and simmer until meat and vegetable are tender, about 15 minutes. Remove bay leaves and season to taste. Remove squash from oven and empty. Pour out the liquid and fill with a portion of stew. Serves 4 to 6 servings. *Though they were about the same thickness, the acorn squash cooked faster and darkened sooner than the delicata squash, which I left in the oven for an additional 10 minutes.